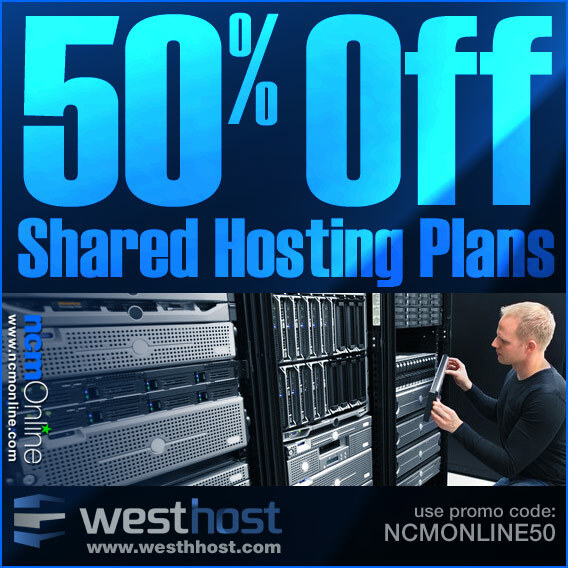 Shop now and receive 50% off WestHost shared hosting plans. Use promo code NCMONLINE50 in your cart when you order. Offer valid only on new orders. All coupons and discounts are only valid towards the initial WestHost hosting plan purchase as all discounted plans renew at the standard hosting rates. Discounts and promotions do not apply to domain name purchases, domain name renewals, or any new or renewing “add-on” services. PLEASE NOTE: While we attempt to provide timely and accurate information, shared and all pricing, features, discounts, coupon codes, promo codes, etc. included on this page are beyond the control of ncmonline.com and are subject to change without prior notice. Some information on this page: © 1998-2015, WestHost. All rights reserved.